Awesome, this is just the kind of statistical analysis that I was hoping for when I worked through the questions. Can’t wait to see what information can be gained from the full set of data. 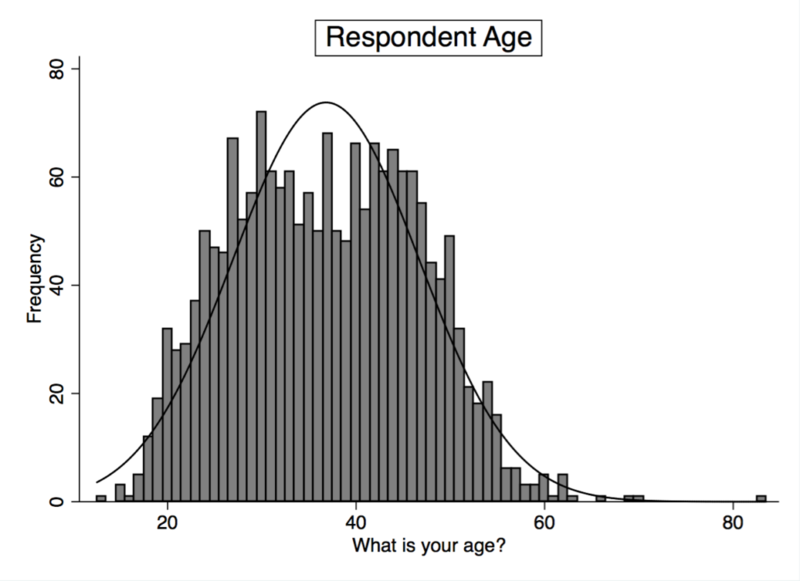 That big dip in people in their late 30s seems very fascinating. 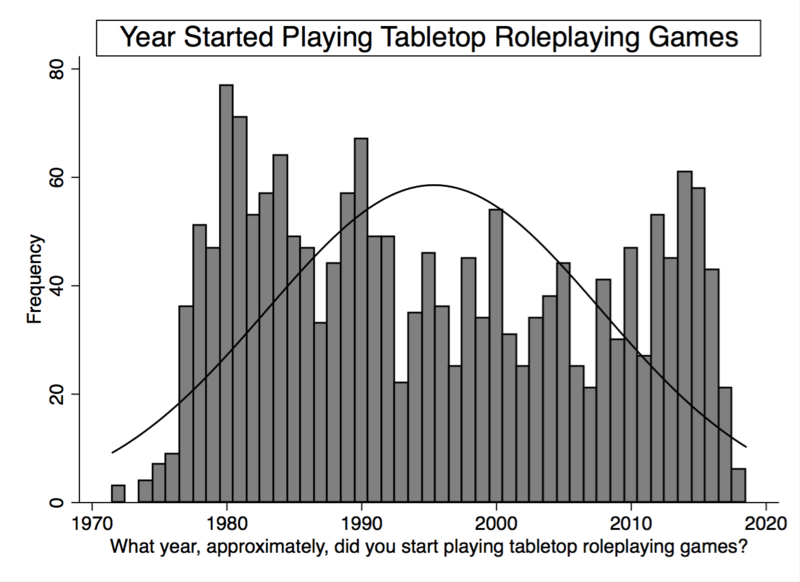 That’s a bit older than me, so people who were around 18-20 in 2000, when D&D 3rd Edition came out. I wonder if there’s a correlation, but getting information about people who didn’t participate from the data might not be possible. Do you know what happened on the 7th to make the number of responses surge up again? Friday night when they couldn’t get a game together maybe? I posted a reminder on Google Plus about the survey on the 7th, along with a note that I would be closing the survey on Saturday. Ben also reshared that post, so my guess is that reminder was responsible for the bump. Kids? I’ve found a lot of parents don’t get the opportunity to play much whilst kids are between certain ages. Oh, yes; that is a good point. I wish I would have asked some questions about family situation. Next time. Just marvelous. Nothing jumps out at me as strange yet but I love the way you present your data. Thank you. Looking forward to the rest of the data. Can I say here how much I hate Google Plus and Mewe. So many things get said and missed by that I feel as if I’m in a bar trying to pay attention to so many different conversations. Blog posts and forums seem so much better to me to keep a record of conversations. I’d love to know why there was such a migration away from those. I suspect that no matter what kind of platform one prefers, there is more content than one can follow. I find forums to be somewhat harder to keep up with because I need to visit them individually, and so each one feels like another inbox to check. Central moderation also creates some problems, so all else equal I would probably prefer a more peer to peer architecture where people follow each other directly rather than post to what is essentially a shared feed under the control of some central authority. Google Plus worked pretty well for me, but honestly I think social media platforms (including forums) depend more on who is participating than on any other properties of the platform, similar to how killer apps or games make operating systems or game consoles attractive. Mewe is currently less flexible than Google Plus and also lacks critical mass, from my perspective. Never having been to google plus, I actually wonder if the majority of the OSR sphere has just turned invisible or has vanished. From the outside it looks like most content creators have almost ceased to show any new creations, or have disappeared completely. Though I think that since the closing of google plus was announced, there seems to be a slight increase in some veterans’ posting. I suspect there are two major forces at play here. First, walled gardens such as Google Plus and Facebook pulled some engagement and attention away from blogs. Second, some people who in the past focused more on blog or other kinds of Internet-shared content turned effort toward publishing content more formally. 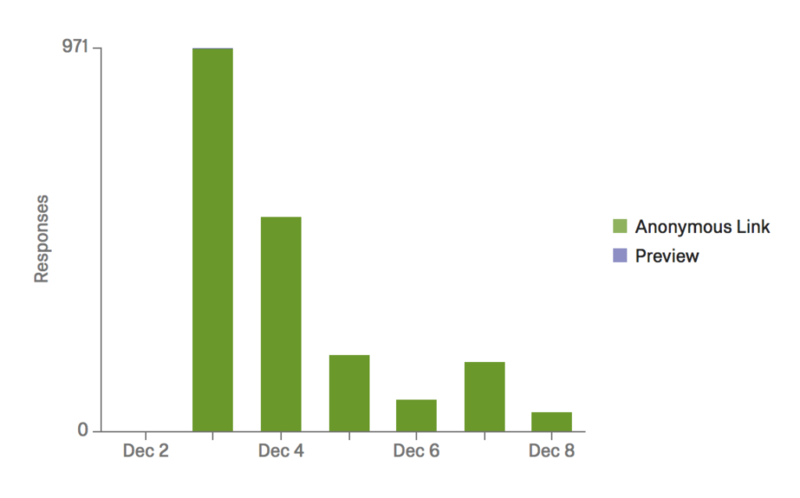 I will be curious to see if the uptick in blog activity persists, especially when Google Plus actually closes. 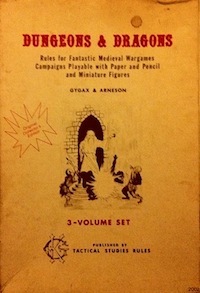 A few weeks ago, based on some input from people on Google Plus, I put together a list of favorite OSR or OSR-adjacent products which came out during 2018, which I included below (the items are in no particular order and I am sure the list is incomplete). This seems like substantial output. * crosstabs or scatterplots of two questions, especially combinations of age, year started, years playing, OSR or not. Yes; you can expect several more posts with results. 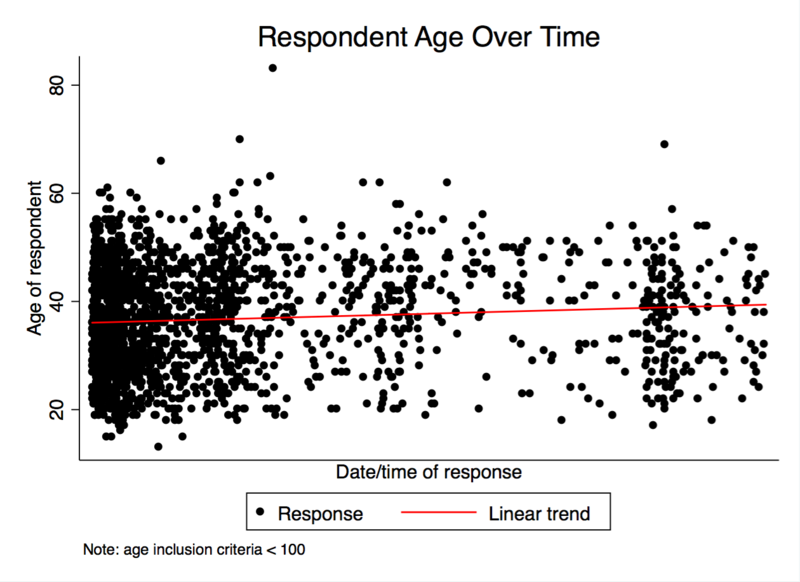 Let me know if you think of other questions that the data may be able to shed light on. Thank you for doing this, this is really fascinating! 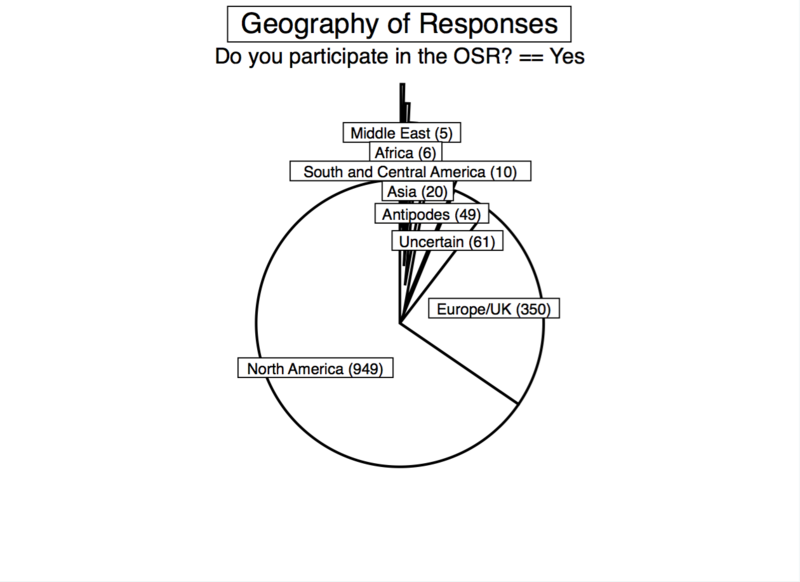 I did a survey back in 2009 as to why people switched to retroclones or OSR games. I have the old blog post and data stashed in an archive, if you’re curious. 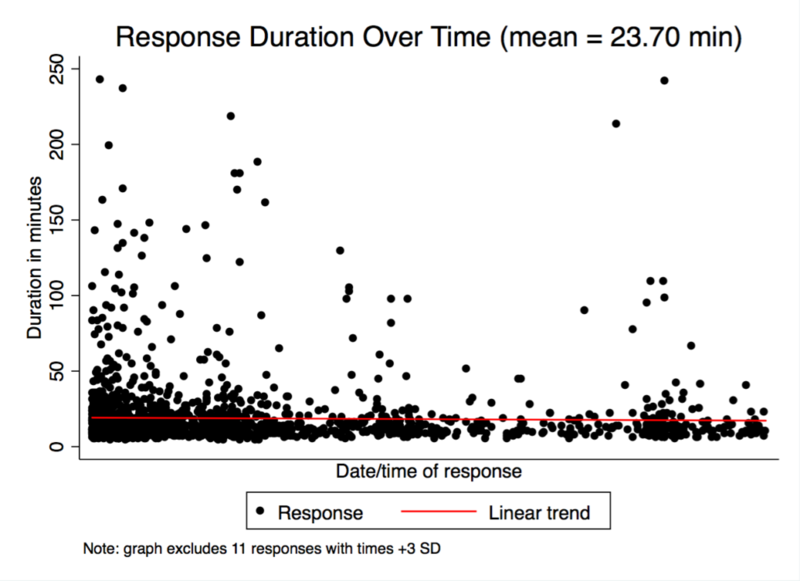 I don’t know if it will line up with any of your data, but you might find it interesting. I can email you the old posts, if you want. Yeah I am curious about your results. You can find my email address in the “About” tab linked from the blog header. Gotta say I’m curious to hear more about the 85 year old gamer. I’m just as curious about the one who’s under ten. Unsure if they’re just taking the piss or if we’ve actually got young kids playing AD&D. I can tell you: that respondent plays AD&D, has been playing a long time, is a self-declared non-participant of the OSR, and heard about the survey on a forum. Hey! I’m a data nut and I love the idea of pie charts as much as everyone else but they’re more or less completely eliminated from modern data analysis because they’re not actually very easy to understand. A bar graph works better 99% of the time. Just something to consider. Glad to hear the results are useful. 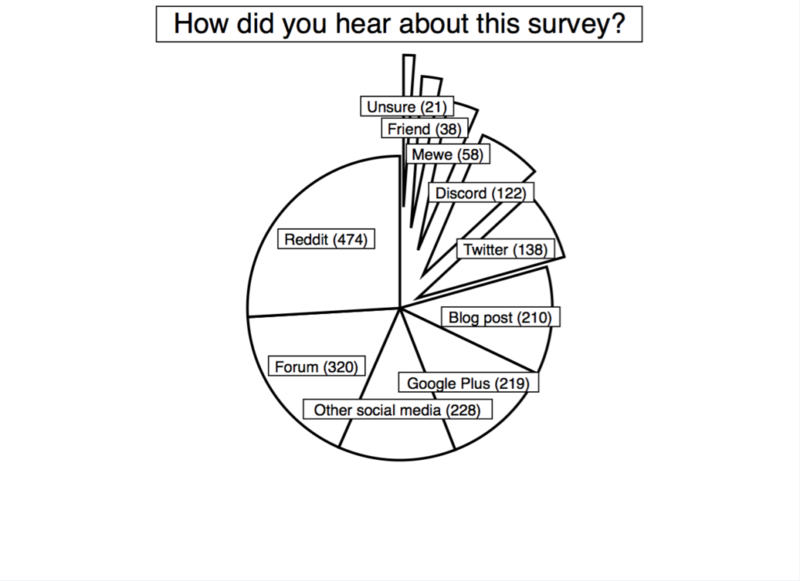 Bar charts are often more appropriate, but the benefit of a pie chart is that it makes clear the mutually exclusive nature of category membership. 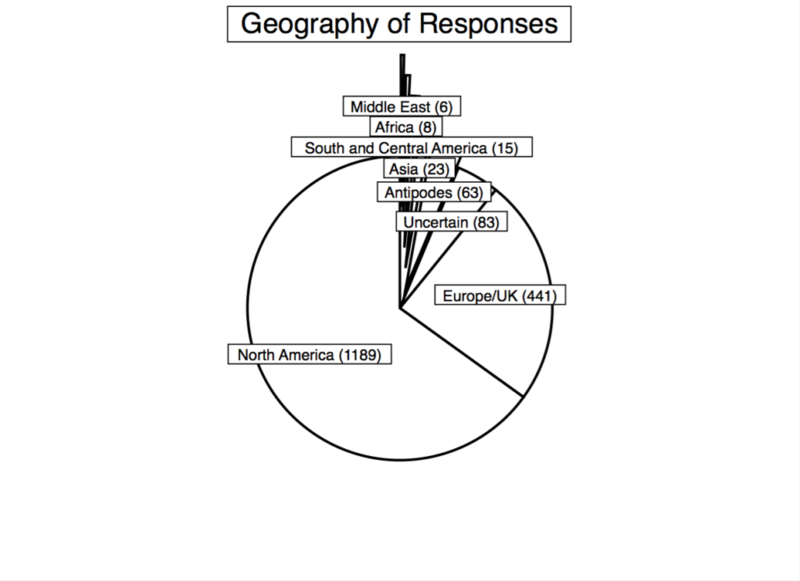 For variables such as country of residence and referral source, pie charts more effectively communicate the data pattern. That said, let me know if you would like to see any distribution or relationship presented in a different graphical manner, as I can make most kinds of figures relatively easily, and different ways of presentation work better for different people.